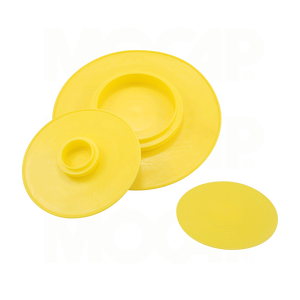 MOCAP Push-In Flange Protectors are designed to fit many different styles and sizes of Flanges, allowing for maximum flexibility. Designed to protect from damage and contamination during transit, handling and storage, our MPI series products are easy to install and remove. Suitable for both imperial (ANSI) and metric (DIN) flanges to specifications DIN2627 - 2638, 150, BS 5504 and ANSIB16,5. Our MPI Series Plugs are moulded in Yellow polyethylene plastic to fit 3/8" thru 12" nominal sized pipe flanges. Many Sizes of Our Push-in Flange Protectors are Stocked for Immediate Shipment.